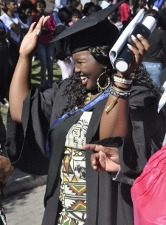 Saturday 11 May marked the end of a week filled with uninhibited laughter, tears of joy and deep sighs of relief as more than 4000 WSU graduands were capped at WSU’s campuses in East London, Butterworth and Mthatha. The auspicious occasion kicked off at the Abbotsford Christian Centre in East London on Monday May 6 and set the tone for the rest of the nine ceremonies as friends and families came in droves to bear witness to the honouring of their loved ones’ hard work and dedication in striving to get their qualifications. Guest speaker, SABC’s Eastern Cape General Manager Zola Yeye’s address on the first day of the proceedings was the perfect point of departure as he shared incisive and highly relevant thoughts about the working industry and what the students will need to do in order to make it. Following hot on Yeye’s heels was Eastern Cape Tourism and Parks Agency CEO Luxolo Rubushe whose address on Tuesday grabbed the attention of all in attendance as it dealt with matters pertinent to the province’s state of tourism, which affects every aspect of the region’s economy. The ceremony then moved on to the Butterworth Campus on Wednesday May 8 where graduates from the Faculty of Business, Management Sciences and Law and the Faculty of Science, Engineering and Technology were capped, followed by the graduation ceremony of close to 500 graduates from the Faculty of Education in the afternoon session. Guest-speakers at the ceremony included businessman Sandile Zungu of Zungu Investments, Chartered Accountant and University of Fort Hare’s Prof Lana Weldon, as well as Momentum Group Sales CEO Dr Khanyile Nkuzuma. Friday May 10 signified the change of venue from Butterworth to the Mthatha Campus’s Nelson Mandela Drive Site where over 1 600 graduands were capped. About 600 graduates from the Faculty of Business, Management Sciences and Law were capped during Friday’s morning session. SAPS Special investigating unit divisional head Jason Jordaan left the audience in awe with his address about the intricacies of cyber-crime. The afternoon session saw graduates from the Faculty of Health Sciences and the Faculty of Science, Engineering and Technology being capped. Former Bafana Bafana team doctor and current health TV magazine host Dr Victor Ramateshele gave a sobering account of the needs within the medical field and the importance this latest batch of WSU-molded doctors will play in striving to fulfill that need. The ceremony culminated in the capping of graduates from the Faculty of Education on Saturday May 11. Nelson Mandela Academic Hospital CEO Nomalanga Makwedini’s input was to urge the country’s institutions to develop independent and critical thinkers who aren’t afraid to speak their minds. To round off proceedings, a specialist at the UKZN head HIV Pathogenesis program, Dr Kholiswa Ngumbela took to the podium to plant more seeds of wisdom in the education faculty graduate’s eager young minds. Central to her address was the importance of management of finances. Ngumbela lambasted teachers for their history of poor handling of money and strongly advised the graduates to always be responsible when it comes to finances.